As time nears for our 29th annual OICX we have been busy prepping to host a fun yet competitive event for all ages and levels. In preparation for this thrilling race we sat down with co-founder/owner Joe Royer to discuss the beginning and creation of the longest running Cyclocross (CX) Bicycle Race in the US. Royer and Outdoors Inc. cycling manager Joel Glasgow recently attended the Union Cycliste Internationale (UCI) World Cup hosted in Las Vegas this year to ensure that our event along the banks of the Mississippi River Sunday, November 1st at the Green Belt Park in Harbortown has all the current flair that the premier international event has. The course is 1.5 miles and asks pros to dismount from their cycles to carry them over obstacles, run up the hills of the park and ride all-out for as many loops of the course as possible in a designated amount of time. Dependent on the weather Royer says the top cyclists this race attracts can expect each lap to take between six to seven and a half minutes. The race is not only for the expert and professional riders as it includes a B race for intermediate riders and even three races for children to ride through the course and short rides for kids just learning to ride a course without obstacles to kids riding on tricycles! Speaking of obstacles, a unique feature found only in this race is that the obstacles riders carry their bikes over are made from recovered logs from the Mississippi River to further add a touch of local flavor. Royer refers to the Mighty Mississippi as North America’s “Mt. Everest” and is proud of how amazed even the top cyclists are of this exclusive feature. 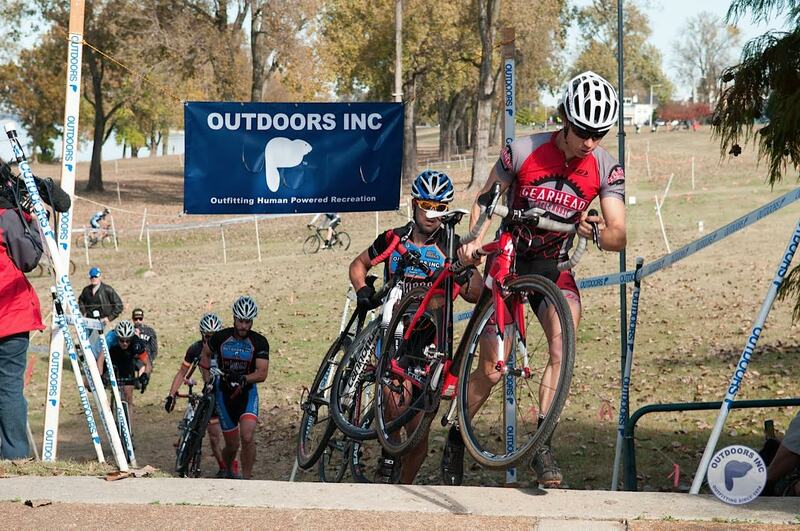 Cyclocross often involves being able to get on and off your bike quickly to get over obstacles. As with this ride, much of Royer’s enthusiasm for his outdoors activities has stemmed from meeting, talking and working with people who find joy in their adventures. For him cycling, paddling the Mississippi (both still current activities) and climbing mountains in the Cascades of Washington to the Alps in Europe have afforded him the chances to engage with other enthusiasts of these sports. “Experiencing the evolution of these sports has been fascinating over the years. Change is good,” said Royer. Join us at the Green Belt Park in Harbortown this Sunday, November 1st to ride, cheer and/or just observe a race unique in the US and characteristic of Memphis. Riders can register beginning at 8am. Races begin at 9am for children, 9:20am for intermediate riders and 10am for expert/pros. Please visit http://www.outdoorsinc.com or email Joe Royer <joeroyer@outdoorsinc.com> for more information and be sure to follow us on Strava for all future rides. Written by: Hallie Burgess and Eric Bleier. Photos by Joe Royer. Get there with Outdoors, Inc! but here are a couple of suggestions. wet, but it will still retain its warming abilities. your head. Keep it in with a wool or fleece hat. 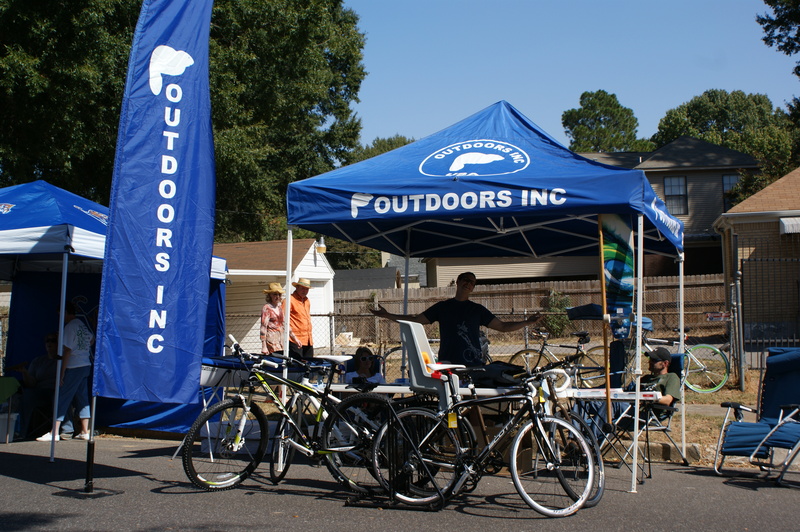 Outdoors Inc is the presenting sponsor of the Memphis Runners Track Club’s Winter Cross Country Race Series for the 3rd year in a row. This four race series takes runners around the Overton Park, Stanky Creek, and Shelby Farms trails. The races vary in length, the first one being a 3k and the final race being a 10k. 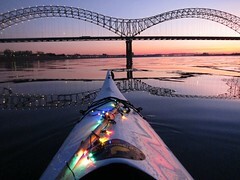 This race series has been a staple in Memphis’ runners Winter regimen. If you are primarily a road runner, this race is a perfect way to ease into the Memphis trail running scene. If you are a strong competitor, this race offers lots of competition, as the turn out is always substantial. Joe Royer, co-owner of Outdoors Inc, suggests “dress warm to train and light to race” for winter racing. If you leave the house feeling comfortable in your clothes, you are probably overdressed. Once you start your run, you will quickly feel your body temperature rise, therefore you will want to shed unnecessary layers. All the proceeds from this race are given to the MRTC Running Scholarship Fund in Frank Horton’s name. If you are gearing up for this wintery race series, we would love for you to come see us. 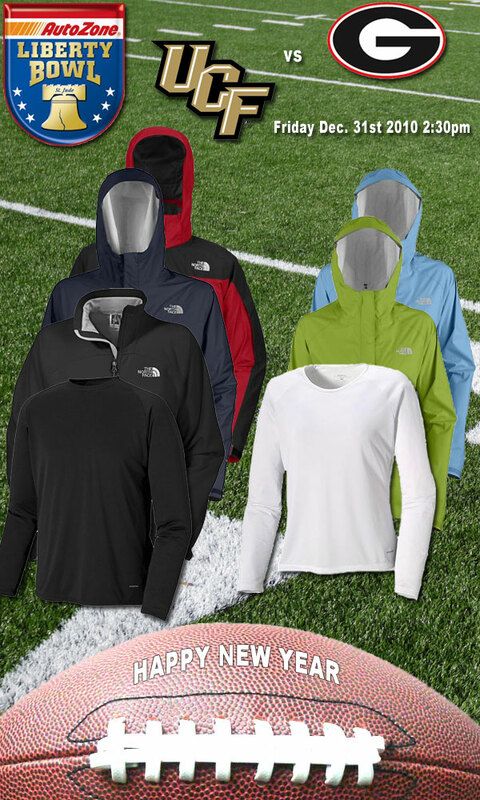 We have plenty of cool weather running gear and experts to guide you to your perfect run. 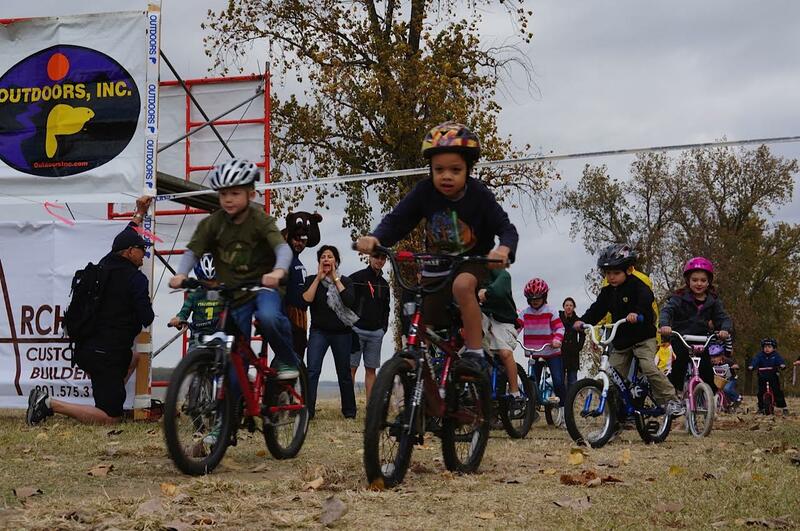 With Memphis cycling in the spotlight, how could you miss one of the premier bike events in our city? Where: Greenbelt Park – Mud Island, Memphis, TN. 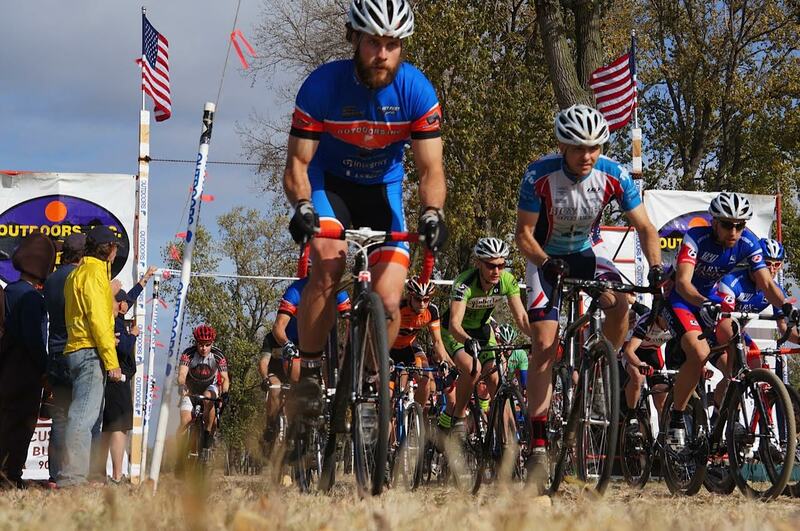 What: Cyclocross racing is 40 to 50 minutes of heart-pounding, adrenaline-fueled bike racing. The course is approximately 1.5 miles long in length with barricades requiring dismount from the rider’s bike. This weekend we got the opportunity to be involved with the opening of the Shelby Farms Greenline, the first of it’s kind in Memphis. People from all over town gathered along the Greenline to celebrate the trail connecting Binghampton to Shelby Farms. This was a huge step for Memphis, pushing us in a more bike-pedestrian friendly direction. Everyone that we talked to glowed with the excitement of the Greenline. If you stopped by the festivities, what was your favorite part? The DJ bike sled? The community togetherness? Shelby Farms Greenline Ribbon Cutting Ceremony – Rejoice! And the bikers, runners, skaters, and walkers rejoiced. This last Tuesday marked the official opening of the Shelby Farms Greenline starting at Tillman street stretching out to Shelby Farms Park. Although it is no secret that the Greenline has been, well, crowded weeks before the official opening, it is only expected to get more populated over time. The Greenline’s Grand Opening event Saturday is expected to pack the trail with skaters, bikers and pedestrians alike. Be on the lookout for a bike sled, propelled by two bikes, and a bike powered generator. You can’t miss it, because it will be carrying a DJ booth. Yes, a DJ booth. Come on out and enjoy Memphis’ first Greenline. It’s something to celebrate! We will be set up with a tent at the High Point Terrace area, so be sure to stop in and say hello!